Chimay Brewery is a beer brewery in Chimay, southern Hainaut, Belgium. The brewery is located in the Scourmont Abbey, a Trappist monastery, and is one of the eleven breweries worldwide that produce Trappist beer. 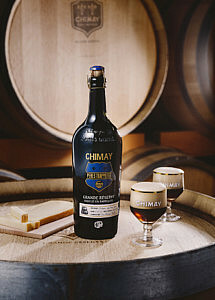 They make three widely distributed ales: Chimay Rouge, Chimay Bleue, and Chimay Blanche; and they make one patersbier exclusively for the monks. The monastery also makes four varieties of cheese. Chimay is an authentic Trappist ale.